Molded Products What Is the Best Material for Your Rubber Bumper? We like to think that we know a thing or two about rubber bumpers, which is why we are very selective about the materials we use for the bumpers we make for our clients. Our standard material is Monsanto’s Santopreme Thermoplastic, which we have found to be very dependable and flexible. Of course, there are many, many different types of plastics available, each with its own unique profile. If you need rubber bumpers that are extremely durable, extra bouncy, or even a little stretchy, come talk to us. We are willing to change things up and use other types of plastic to meet the needs of your products. 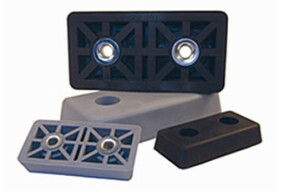 For example, in the past we’ve used polypropylene and polyethylene to make our bumper feet. If you need a very specific plastic profile, we may be able to accommodate your needs or even consult with you to determine the best material possible for your rubber bumpers. Give us a call today to schedule a materials consultation at (858) 549-5050.